Business Process Management (BPM) strives for the improvement of how companies conduct cross-functional work and ensures that company-wide capabilities are available that enable the effective management of the entire business process lifecycle (vom Brocke and Rosemann 2015). Over the last decades, BPM had a strong inward-driven focus characterized by the sound identification, analysis, and solving of process problems related to waste, variation, or cost. As a consequence, a large body of knowledge and methods such as Lean Management, Six Sigma, or workflow management has emerged. However, the uptake of digital technologies that not only focus on process automation, but also enable entirely new business processes means that the current set of BPM approaches is no longer sufficient. The penetration of economy and society by digital technologies is referred to as digitalization, a global phenomenon leading to an opportunity-rich, hyper-connected, fast-moving, and highly competitive environment (Gimpel and Röglinger 2015). Digital technologies substantially affect our private lives and work practices (Gartner 2016). Consider the following examples: Social and mobile technologies (e.g., social media and social collaboration platforms) revolutionize how people communicate and emancipate work from time and location. Equipping physical objects with sensors, actuators, computing power, and connectivity, the Internet of Things boosts the fusion of the physical and digital world. Combined with the potential of Blockchain-empowered solutions, it enables novel value exchanges among individuals, businesses, and smart things, reduces the distance between customers and companies, and grants access to so far unexplored data sources. Further, data analytics – including the latest advances in cognitive technologies – enable capitalizing on data in a diagnostic, predictive, and prescriptive manner, building the foundation of data-driven business models, the automation of unstructured tasks, and natural interaction between humans and machines (e.g., social robotics). Finally, 3D/4D printing disrupts supply chains and value networks by enabling highly decentral, delayed production facilities. As digital technologies enable so far unimaginable business processes, digitalization is a true game-changer for BPM, posing manifold challenges and opportunities. To name a few examples: smart things are becoming full-fledged actors in business processes, leading to new human-robot-interactions. Business processes are becoming data-intensive such that complex and real-time data assessments determine decision-making along business processes. Crowdsourcing and crowdsolving facilitate resource engagements, allowing for the identification of new or the rapid scaling of external resources. Inspired by the challenges and opportunities associated with digital technologies, we were motivated to investigate the question how BPM needs to be re-conceptualized to enable effective and efficient work in the digital age. In doing do, we acted on the assumption that a lack of BPM renewal leads to a rapidly declining relevance of BPM as it would be unable to harvest the rich design space available in the digital age. To answer this question, we conducted a global Delphi study with 30 carefully selected BPM experts from academia and industry. This research included an anonymous multi-round consensus-seeking method. The essential outcome of this study is a new framework including BPM capabilities regarded as vital in the digital age. Our BPM capability framework (Figure 1) includes 30 capabilities structured along the established core elements of BPM (i.e., strategic alignment, governance, methods, IT, people, and culture) (de Bruin and Rosemann 2007). For our purposes, we merged ‘methods` and ‘IT`, as all methods can be supported by IT in the digital age. Strategic alignment refers to the continual alignment of organizational priorities and processes, enabling the achievement of business goals. In the digital age, strategic alignment must strongly focus on the value proposition of business processes and BPM. It must ensure that the benefits associated with business processes and BPM are realized in line with the expectations of re-conditioned, digitally savvy customers, and other stakeholders. Transparency is needed about how processes are positioned within the enterprise architecture and inter-organizational value networks. This allows for prioritizing processes in line with their need for improvement and their contribution to corporate purposes. Methods are the approaches and techniques that support and enable consistent process actions and outcomes. IT refers to the software, hardware, and information systems that enable and support business processes. Heavily IT-supported methods are needed in all BPM lifecycle phases. In the digital age, process design should fit multiple purposes (e.g., customer-centric, risk-aware, or flexibility-aware processes) and enable mass-personalized processes. In line with the importance of contextual process and BPM governance, process context management evolves into an essential capability. The same holds for process data analytics and BPM platform integration. Process execution must support the dynamic re-design of business processes as well as the handling of emerging processes and processes where no process models are available. Process improvement must support an agile and a transformational mode. The agile mode, for example, must enable the intuitive and rapid redesign of business processes as well as the fast data-driven assessment of these processes based on performance data and customer feedback. Process automation must tackle unstructured tasks and enable new forms of human-machine interaction by leveraging opportunities of digital technologies such as cognitive automation, social robotics, and smart devices. People are the individuals and groups who continually enhance and apply their process-related expertise and knowledge. 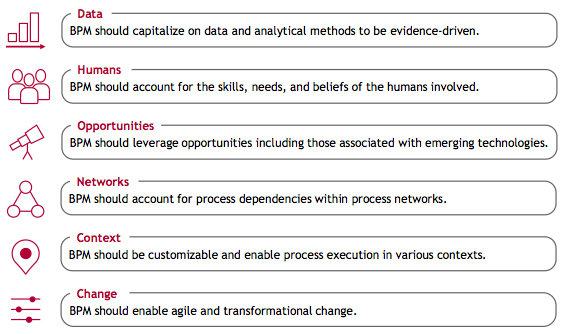 We identified five people-related capabilities relevant in the digital age. First, employees still require substantial knowledge about BPM methods and tools as well as about relevant process domains. To thrive in the digital age, employees must be familiar with data analytics, data privacy, and data security techniques. This also holds true for innovation techniques (e.g., design thinking), customer analysis techniques (e.g., customer journey mapping) as well as for knowledge about the mechanics of the digital economy and digital business models. Culture comprises the collective values and beliefs that shape process-related attitudes and behaviors. In the digital age, new process values and beliefs are required. We found that it is still necessary to establish business processes as an essential topic of corporate management and to foster cross-functional thinking. In line with the access to unlimited data and the uptake of data analysis techniques, BPM requires the commitment to ground important decisions on data as opposed to managers` gut feeling. BPM in the digital age also requires the commitment to continuously scrutinize existing, even long-standing, business processes and to learn from failure in a fast and iterative manner. In the digital age, BPM must actively involve employees in process decisions, account for the effects of these decisions on employees` work lives, take customer feedback seriously, and grant employees the sovereignty to make self-dependent decisions if they encounter unprecedented challenges. From a bird`s eye perspective, our BPM capability framework encompasses traditional and novel capabilities, meaning that current BPM capabilities do not necessarily become obsolete in the digital age. In fact, we found that many capabilities will still be relevant in the future, but need to be enhanced. For example, BPM and business processes still need to be aligned with corporate objectives and purposes. Further, method and IT support are in high need for all BPM lifecycle phases, and business processes still need to be established as central unit of analysis in corporate management. As for novel capabilities, process governance must become contextual, meaning that organizations must support various processes types and contexts. Likewise, BPM itself needs to become contextual, meaning that BPM methods and tools must be configured in line with the process types and contexts to be supported. Consequently, it is crucial that organizational contexts are continuously monitored. Further, architectures and data will play a central role. Architectures must account for process dependencies as well as for inter-organizational processes and value networks. Data must be leveraged at design and run time for analytical and compliance checking purposes, leveraging predictive techniques wherever reasonable. As a final example, BPM must strive for the next level of process automation. Digital technologies should not only be employed for automating well-structured tasks, but also to tackle unstructured tasks together with employees and customers. In a nutshell: In the digital age, BPM will still deal with overseeing how corporate work is performed and with the improvement of business processes (Dumas et al. 2013). Nevertheless, to serve its purpose of enabling efficient and effective work in the digital age, BPM must further exploit established capabilities and explore novel ones. To do so, BPM must embrace six overarching themes across all capabilities: data, humans, opportunities, networks, context, and change (Figure 2). Please do not hesitate to contact us in case you require more information about the capabilities included in our framework. The results of our research will soon be published at http://www.digital-bpm.com. Georgi Kerpedzhiev studied the Elite Graduate Program “Finance & Information Man-agement” at the University of Augsburg, University of Bayreuth, and the Technical University of Munich. Since summer 2017, Georgi is a research associate at the Re-search Center Finance & Information Management (FIM). Georgi is interested in topics including the future of work, BPM, and digitalization. Georgi can be contacted via georgi.kerpedzhiev@fim-rc.de. Ulrich König studied Computer Science and Information Management (M.Sc.) at the University of Augsburg. Since January 2016, Ulrich is a research associate at the Re-search Center Finance & Information Management (FIM) and interested in process deviance, robotic process automation, the future of BPM, and digitalization. Ulrich can be contacted via ulrich.koenig@fim-rc.de. Dr. Maximilian Röglinger is Professor of Information Systems and Value-based BPM at the University of Bayreuth. In addition, he is Deputy Director of the Research Center Finance & Information Management (FIM) and working with the Project Group BISE of the Fraunhofer Institute for Applied Information Technology (FIT). Maximilian’s activi-ties center around BPM, customer orientation, and digital transformation. In BPM, Maximilian focuses on BPM decision-making, the impact of digital technologies on BPM and process project portfolio management. His works have been published in re-nowned journals. Please contact Maximilian via maximilian.roeglinger@fim-rc.de. Dr. Michael Rosemann is Professor of Information Systems at Queensland University of Technology and the author/editor of seven books, more than 250 refereed papers, Editorial Board member of ten international journals and co-inventor of US patents. His publications have been translated into Russian, Mandarin, German and Portuguese. Michael’s main contributions to the global body of BPM knowledge have been in the areas of ambidextrous BPM, BPM maturity assessments, BPM governance, configura-ble business process, guidelines of process modeling, rapid process redesign and con-text-aware BPM. Michael has been a keynote presenter at all major global profession-al and academic BPM conferences. He can be contacted at m.rosemann@qut.edu.au.